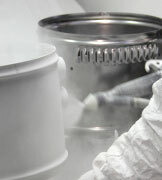 Central vacuum applications beyond the typical residential installation can look to Modern Day to meet the challenge. Specific models within this line address the need for high waterlift, high CFM, and extra-long-life. Options include metal motors, 2000+ usage hour motors, and motors as large as 8.4” diameter. Since 1961, all Modern Day units have featured by-pass Ametek motors that contain a separate cooling fan to insure that the motor does not overheat. Designed and assembled in the USA, Modern Day is built with 18 and 20 gauge steel, powder-coated inside and out, and features the highest quality electronics. Modern Day’s Tru-Seal Microfiltration keeps the motors clean, providing a ten-year warranty for long-term, trouble-free maintenance when used in residential applications. 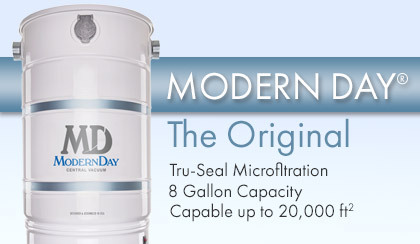 Modern Day utilizes the Tru-Seal ® Microfiltration System featuring a 5-ply, closed bag microfilter that holds 8-gallons of debris and effectively removes particles as small as .3 microns from the air stream without hindering vacuum performance. With high waterlift, high CFM, or high air-watts, each Modern Day unit delivers the best cleaning power to deep clean commercial or light industrial applications.